Obama's last press conference: "In my core, I believe America will be okay"
Just two days away from his successor’s inaugural ceremony, President Obama gave his final press conference in the White House briefing room, stressing the importance of reporters and taking questions on a variety of policy issues. The president began by saying the White House had been in touch with the Bush family after former President George H.W. Bush and his wife, former first lady Barbara Bush, were hospitalized in Texas. “They are as fine a couple as we know,” Mr. Obama said. The president went on to thank the White House press corps, saying he’s “enjoyed working with all of you.” He stressed the importance of a free press, just as speculation swirls about White House reporters’ future in the executive mansion’s briefing room. Members of the Trump administration have repeatedly said they may move the White House press corps to a location off the premises once Mr. Trump takes office. Despite the doom and gloom some in his party are forecasting with the inauguration of Mr. Trump, Mr. Obama concluded his final press conference on a positive note. “In my core, I believe America will be okay,” the president said. Read below for more information on the president’s answers to questions involving his recent commutation of soldier Chelsea Manning, foreign policy challenges, the upcoming inauguration, and his legacy on civil rights. The president was asked about his decision a day earlier to commute the 35-year sentence for Chelsea Manning, who leaked U.S. government documents to WikiLeaks and whether he was sending the wrong message to future whistleblowers or leakers. Weighing in on sanctions placed on Russia by his administration -- which Mr. Trump could repeal once he’s in office -- the president noted that “it is in America’s interests and the world’s interests that we have a constructive relationship with Russia.” But he cautioned that it was “important to remember... the reason sanctions have been put in place” was Russia’s invasion of Ukraine in 2014. The U.S. must stand up for the principle that “big countries don’t go around and invade and bully smaller countries,” he said of Russia. President Obama also urged Mr. Trump not to confuse sanctions on Russia related to Ukraine with leverage on nuclear nonproliferation or other issues. “I continue to be significantly worried about the Israeli-Palestinian issue, and I am worried about it both because the status quo is unsustainable, that it is dangerous for Israel, that it is bad for Palestinians, that it is bad for the region and that it is bad for America’s national security,” Mr. Obama said when asked about U.S. policy on the issue under the Trump administration. The president said he came into office wanting to do everything to encourage serious peace talks between the Israelis and Palestinians. “Ultimately, what has always been clear is that we cannot force the parties to arrive at peace,” he said, adding that the U.S. can only facilitate and provide a platform on peace talks. Mr. Obama emphasized that the possibility of a two-state solution must be preserved, because there is no good alternative. 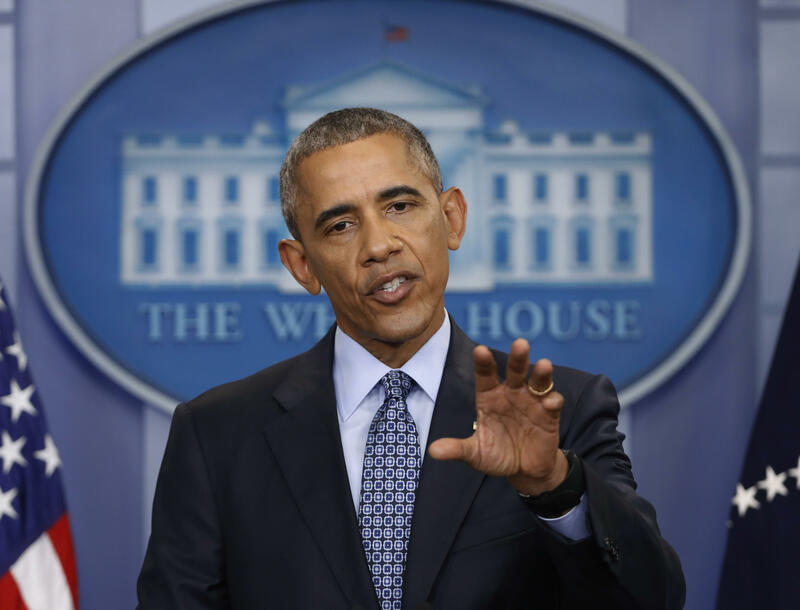 “I don’t see how this issue gets resolved in a way that maintains Israel as both Jewish and a democracy because if you do not have two states,” Mr. Obama said that you cannot have one state in which millions of people are disenfrancished and live as second-class residents. Will there ever been another black president? Mr. Obama was asked about gaps still remains when it comes to rights issues and what role he might play after he leaves the White House. “I worry about inequality because I think that if we’re not investing in making sure everybody plays a role in this economy, the economy will not grow as fast, I also think it will lead to further and further separation between as Americans,” he said. The president said there are still restrictions on voting rights, which he said stem from Jim Crow laws and “the legacy of slavery.” He also called reports about voter fraud “fake news” and said that Americans should reexamine the flood of money into politics. “We’ve got more work to do on race,” Mr. Obama said. The president said that he has offered Mr. Trump his best advice, counsel about certain issues -- both foreign and domestic. He acknowledged that there likely won’t be “enormous overlap” between his policies and those put forward by Mr. Trump. The president was asked to comment on the growing list of House Democrats who want to boycott Mr. Trump’s inauguration on Friday. The president said he ended the so-called “wet-foot, dry-foot” policy with Cuba, which said any person who fled Cuba and entered the United States would be allowed to pursue residency in the U.S., because of the changing state of the U.S.-Cuba relationship. “That was a carry over of an old way of thinking that didn’t make sense in this day and age,” Mr. Obama said of treating Cuban immigrants differently from others. Asked about how he viewed his legacy on LGBT rights, the president attributed much of the progress to grassroots activism and those who “courageously” opened up about their own experiences. “I think that what we did as an administration was to help to the society to move in a better direction,” the president went on, citing his “methodical” approach to repealing “Don’t Ask, Don’t Tell” policies in the military. President Obama gushed on about how proud he is of Malia and Sasha, giving insight into how the two first daughters have reacted to the results of the 2016 election. “What makes me proudest about them is they also don’t get cynical about it,” he said, noting that he feels hope in the younger generation because of that attitude.